A railway bridge over Briggate River in Whittlesey is set to be replaced during the August Bank Holiday weekend. The bridge is on the line between Ely and Peterborough which is used by up to five passenger trains an hour, and 12 freight trains a day. Between Saturday, August 26 and Monday, August 28 the existing timber decked bridge will be replaced with a stronger steel decked bridge. Without the replacement, a speed restriction would be needed to protect the bridge from heavy trains, resulting in delays to both passenger and freight services. The new bridge will also last longer and is less expensive to maintain. The works, which will cost approximately £1.5 million, have been planned so the river can be kept open during the replacement, with a team of lookouts being employed to stop work if river traffic needs to pass without it impacting on the delivery of work. Meliha Duymaz, Network Rail’s route managing director for Anglia, said: “We are replacing this well-used bridge with a much stronger one, which will mean fewer delays for passengers. “The new bridge has the added bonus of being more economical to maintain, which means we can spend money on improving other parts of Anglia’s network as part of our Railway Upgrade Plan. As part of the work, the track will be replaced and the ballast, the stones which form the track bed, will be made deeper to improve drainage to increase reliability. 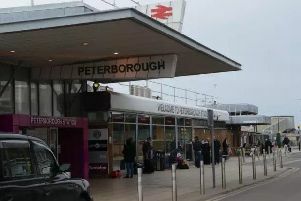 Passengers are advised to check before they travel as a rail replacement bus service will run between March and Peterborough throughout the works. Visit www.nationalrail.co.uk.